Blackheads, also known as open comedones are tiny, dark spots that appear on the surface of your skin. Blackheads are blocked pores (hair follicles) in the skin that are filled with skin debris or keratin and sebum, an oily substance. Blackheads occur mainly on the face and nose and are a common problem among adolescents especially those with oily skin. Blackheads can be called first stage acne, before bacteria enters the clogged pores.Blackheads are a skin problem that you surely want to remove as fast as possible. They are small bumps caused by clogged hair follicles. Its dark surface, caused by oxidation, can be very unsightly.People of any age can have problems with blackheads on their skin, but most often it is an issue during the teenage and adolescent years. Blackheads commonly occur on the face, particularly the nose. They can also appear on the ears or anywhere else on the body. Two main causes of this problem are hormonal changes in the body and excessive use of cosmetic products.It is so easy that you can even remove the blackheads from your nose and face by just using home treatments. Blackheads home remedies are not only affordable, they are effective and safe to the skin as well. Put your face over a sink or a bowl filled with steaming-hot water, or cover your face with a wash cloth soaked in hot water. This is optional, but can be very beneficial. Try to get the steam as hot as possible, but make sure it is comfortable for you. The tomatoes which have antiseptic properties are effective in de-clogging your pores and to get rid of blackheads. Mash the tomato and use its juice and peel as a facial treatment. 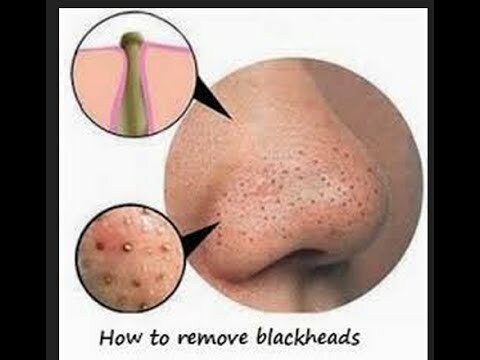 Concentrate on areas (Nose & Face) where the blackheads are found. Let it stay overnight on your face. This tomato treatment will dry up blackheads. This will make blackheads naturally fall off from the surface of the skin. Lemon juice, also used in acne treatment, can help remove blackheads. The nutrients and vitamins present in lemon juice are good for all skin types.Make a facial scrub by mixing lemon juice with salt, yogurt and honey. Gently scrub the affected area with this natural exfoliating mixture. You can also mix fresh lemon juice with milk or rosewater to create a facial cleanser. Use it daily for 10 to 12 days. You can create an effective blackhead removal paste by mixing the whites of the raw egg and honey. Apply this all over the face, concentrating on the area of the nose where the blackheads are visible. Leave the paste for thirty minutes or until your face feels tight. Rinse the paste very well using warm water. This treatment will remove your blackheads. Also, your face will be clear, and glowing after you have done this natural treatment. The balancing quality present in honey is good for both oily skin and blackheads. Honey hydrates as well as tightens the skin pores, giving you a clear complexion.Honey has antiseptic properties that work wonders for both oily skin and blackheads. Apply honey onto the affected area and wash off with warm water after 15 minutes. Mix enough amount of sugar to honey to create a natural facial scrub. After cleansing the face, use the sugar-honey mix to scrub the nose and other areas of the face where the blackheads are visible. The scrub will slough off the dead skin that will permit the blackheads to surface. Once your blackheads have surfaced, it is now easier to be removed from the skin. Mix half teaspoon of cinnamon with one teaspoon of honey. Apply it on your skin. Leave it for 5 minutes and wash off with lukewarm water. It helps to remove dirt from the pores and removes blackheads from nose and face. Mix one teaspoon of dry green tea leaves with a little water to make a paste. Gently scrub the paste over the affected area for two to three minutes. This scrub deep cleans oily skin and helps unclog pores. Rinse it off with lukewarm water. Baking soda is an effective treatment for blackheads as well as acne. It helps clear the skin of impurities such as debris and dirt.Mix two teaspoons of baking soda with mineral water to make a paste. Apply the paste generously on the affected skin area and massage gently. Allow it to dry for a few minutes before rinsing it off with warm water. Repeat this remedy once or twice a week. Turmeric, which works well for minor blazes, can likewise be utilized to get rid of blackheads. To make a paste you have to take 2 tsp of mint juice and mix with turmeric powder. Now, apply it directly to the blackheads and leave it for a few minutes to get dry and afterwards wash the area with lukewarm water. You can likewise make a thick paste by mixing turmeric powder, milk and red sandalwood together. Apply it on the affected area and following 10 minute wash the skin with water. One of the most effortless and easiest natural solutions to get rid of blackheads is fenugreek. Make a thick paste by mixing fresh fenugreek leaves with a little water. Apply it on the affected area and allow it to dry for approx. 10 to 15 minutes. After drying, wash it with lukewarm water. Utilize this cure daily. Try not to touch your face too much to prevent the exchange of oils from your hands to your face. Keep your hair clean. In the event that you have a clean face, oil from the hair can gradually run down your face and clog up spots. Changing your pillowcase regularly aides prevent future breakouts and helps to get rid of blackheads. Wash your face daily, avoiding cleanser. Utilize an exfoliator scrub or out and out water sprinklers. Blasts may irritate the skin, so try to tie them up or have them trimmed. Put cold water on your face after you utilize a treatment so your pores therapist back down and don’t get as much dirt. Continuously utilize without oil moisturizer because you would prefer not to clog your pores much more. Wash your face at least one time in a day, and also try to wash it more times in a day if possible. If you follow this process, you will see visible results within 4 or 5 days. Off and on again a pore minimizer can help decrease blackhead breakouts. To keep oil away from your face, use smudging papers or oil absorbing sheets, Clean and Clear Oil Absorbing Sheets (or CVS oil absorbing sheets) are modest and effective and can be bought at any medication store.